This will be a short post, as we are grand-daughter-dog sitting! Our Rosie is a sweetie, but she's still all pup, and needs our attention! I wish you could see her walking on this computer...lol!!! It is Sunday morning, and you know what that means - a new challenge at Stampin Sisters in Christ! Lisa, our amazing leader, is our hostess this week. The scripture that Lisa has chosen for this challenge is one of my favorites. He leads me in paths of riteousness for his name's sake. You prepare a table before me in the presense of my enemies; you anoint my head with oil; my cup overflows. Surely goodness and mercy shall follow me all the days of my life, and I shall dwell in the house of the Lord forever." We had fun with this week's challenge, and I think that you will all have fun with it, as well! Lisa asks that we use blue (still waters) and green (green pastures) in your cards/projects. Our sponsor this week is Taylored Expressions. One lucky winner will receive the Rest and Renewal set from Taylored Expressions! For my card, I used a piece of the CS that comes free in the Take Ten magazines for my background. It was perfect, in that it was already blue and green. 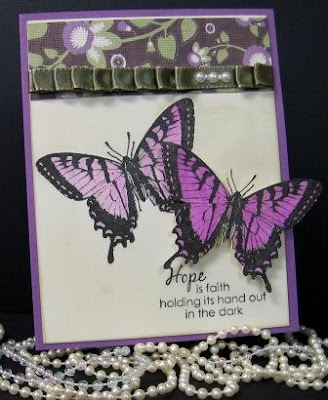 I stamped the butterfly from The Angel Company's "Happily Grateful" set, and the sentiment from the Our Daily Bread "Still Waters" set with Palette Noir Ink, covered them with Transdescent Embossing Powder, and Heat Embossed. The border is done with an E.K. Success border punch. Hope you have a wonderful Sunday! We have a winner, and a new question! Hello friends, and Happy Saturday! We are going to have a beautiful day in Missouri - SUNSHINE and FORTY THREE degrees! Oh, yeah, I'm lovin' this forecast! The sun is already tempting me to be outside today, rather than inside! Of course, look out Monday and Tuesday - freezing rain, sleet, and snow predicted. Hope you are enjoying a beautiful day, as well! 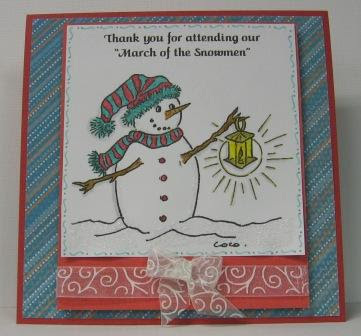 Thanks to everyone who attended the March of the Snowmen Blog Hop!!! Weren't there some amazing projects out there this year? I would have a tough time choosing a favorite! A bit later in the post, I'll tell you who the lucky winner of my blog candy was!!! First, I have a new question for the smartest readers in the world!!! I would love to know what kind of paper/cardstock that you all use for digital printing, and for coloring! Do you use one type for copics, and another for waterbased markers and colored pencils? Where do you find the best prices on your papers/cardstocks? I know that's more than one question, but it's all related! I'll draw a winner for an itty-bitty blog candy from all who comment on this post! As usual, if you are a follower, your name will go in twice! Thanks for being patient with me this week - my computer is pretty much shot. I think it's time to purchase a new one....ugh...who's got money for that??? Okay, on to official business! Please email me at mamagilliam@gmail.com so I can get all of your details for your gift card to Joan's Gardens! How much fun! The Hoosier Stamper is a brand new follower! Have a wonderful weekend, dear friends! Back tomorrow with a Stampin Sisters in Christ card. Thanks for joining us in our blog hop today! Our hop today, is meant to give one of our own blogging friends some smiles, and some love. 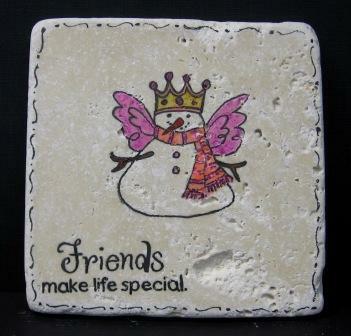 Our friend, and fellow stamper, Colleen Dickenson, was introduced to rubber stamping by her daughter, Valerie. About ten years ago, the unthinkable happened. Valerie died in a one car black ice accident, on her way to work. Colleen inherited Valerie's stamping supplies, and ten years later, she's still using Valerie's heat gun! 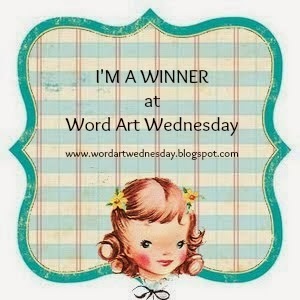 A short time ago, Colleen entered a "Name that Stamp" contest at Whimsy Stamps, hoping to name a stamp after Valerie. The stamp very much made Colleen think of her Valerie. Whimsy replied that they had chosen another name for that particular stamp, but that they were so touched with Colleen's story, that they wanted to honor Valerie by calling this new stamp (featuring the same little girl) "Valerie's Gift", as they knew what a gift Valerie was to Colleen. Whimsy Stamps sent Colleen the new stamp, and the rest is history! When Mary Anne and Olga found out about this, they put this blog hop in motion, in hopes of surprising Colleen. What a wonderful feeling it is to be able to do a RAK like this for one of our blogging friends. 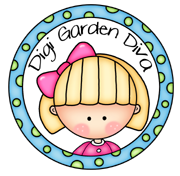 Colleen, I was so honored to be asked by Mary Anne and Olga to take part in this blog hop. As a parent, I can only imagine the horror of that night ten years ago, and now, the pride of knowing that Valerie will live on forever, bringing fellow stampers everywhere hours of enjoyment. Hugs, prayers, and blessings to you, my friend. Supplies: Basic Grey Hopscotch Collection, ZVA Pearls, Copic Markers, Copic Spica Glitter Pens, Doily from Dollar Tree. Next stop on the hop is: Shirley Hotop! Head on over to see Shirley's beautiful creation! Thanks so much for stopping by today. 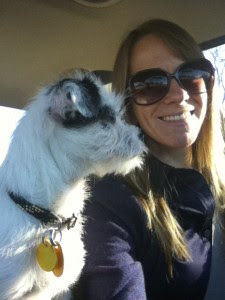 If you have time, please drop by Colleen's blog after this hop, and leave her a bit of love! Patti J. - That's Me - You're Here!!! First, I apologize if I have not gotten to your blogs. My computer has once again become ill. I think it needs a new fan, as it works for a few minutes, and shuts off as soon as it gets 'hot', but as it is a mini tower, there are none just laying around, so it could be another week or so before I get a new one. Thanks for being patient with me! I was so excited to drive into town to the Post Office the other day and find HAPPY MAIL! I received a wonderful yellow envelope with a new set of stamps, from a stamping friend! The stamps were one of Gina K. Designs' new sets, "Gleefully Yours", illustrated by Nina Brackett...what fun! I needed a clean and simple card, and just couldn't wait to open the stamps and ink them up. Another wonderful surprise! I had not seen any of Gina's new 'pre-cut' rubber yet, and OMG, how delightful! I am impressed, and in love - what a great time saving concept! My card is on TAC's Birch CS, and is background stamped with Versamark. 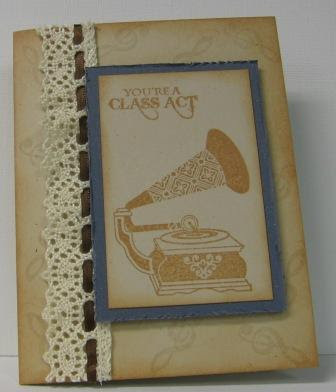 The image and sentiment are stamped with Tim Holtz Tea Dye Distress Ink. Distressing is also done with Tea Dye. The blue CS was some blue sparkle CS from TAC, and the trims are from my stash. You can be sure you'll be seeing more from me using this set!!! Stop by tomorrow morning for a very special treat! Can't tell you what, because it is a top secret mission, but I can guarantee, you will like it!!! Hello! Welcome to the second annual "March of the Snowmen" blog hop! I am still trying to figure out how I got into this hop with such amazingly talented stampers! 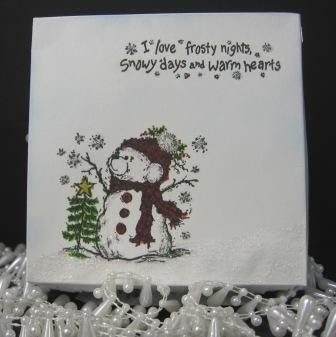 We hope that you love snowmen as much as we all do, and that you have fun along the way! 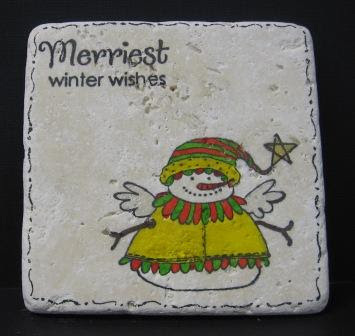 Hopefully, you will be inspired to dig out your snowmen stamps, clay, etc., and create some winter smiles of your own! Many of the stops on today's hop will also feature blog candy, so be sure to stop and comment on each blog! What's more fun than LOTS of candy? I'll be telling you about MY candy at the end of the post! 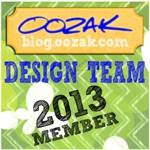 My card features a digi image by Cocodingo, at Craft Your Passion. I was lucky enough to win this image a couple of months ago, in one of their challenges, and hadn't had time to ink it up! The sentiment is computer generated. Coloring is done with Copic Spica Glitter Pens. DP is Stampin'Up! Ribbon is from my stash, and sparkles on the snow are done with White Frost Stickles. 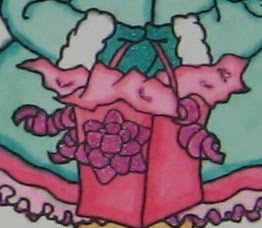 This next photo is the side of the gift box that holds my project for today! Here is the lid topper. SK624a and SK624b are the only markings I could find on the snowperson and sentiment. Inside the box is a set of tumbled tiles that I got at Lowe's, for less than $1 each. I thought that DD, who has a darling snowman collection, might enjoy receiving these! You won't want to miss the next stop on the hop...the very talented and creative Sue Pelletier! In case you have trouble with links along the way, I have listed the entire blog order below. Patti Gilliam ... you are here! On to my blog candy! One lucky winner will receive a $20 gift card to Joan's Gardens! If you have never checked out Joan's store, you must do so! My goodness, she has absolutelty everything, and she is a sweetie, as well! If you are a blog follower, you will have two chances to win!!! You will have until midnight Friday, January 28, 2011 to leave your comment. One winner will be chosen and posted on Friday via Random Number by DD!!! 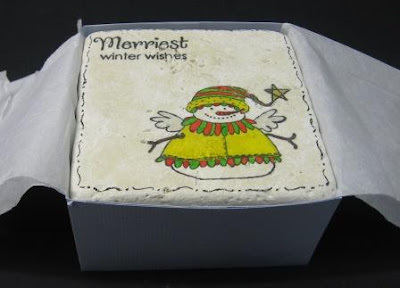 Best of luck, and thanks so much for joining us on our "March of the Snowmen" Blog Hop! How much fun is a 13th birthday? Every kid waits for what seems like forever to become a 'teenager'! Betty Roberts' (Simply Betty Stamps) daughter, Rio, is no exception, and will turn 13 on February 8th! When asked by Betty what she wanted for her birthday, Rio asked, "Mom, is it really my choice what I get for my birthday?" Betty assured her that it was her choice. Rio then says, "Ok, this year, mom, I want money, but can I do anything at all with it?" Betty said "Of course you can." (Get your tissues ready...) Rio continues, "Okay, I want my birthday money to be donated to the children of St. Jude's hospital, so they can have a special day, or whatever the money is needed for. I don't want to have money to just blow, when I can help other kids that can't get out of bed, or go outside. That's what I want for my birthday." Rio is a very special 13 year old! 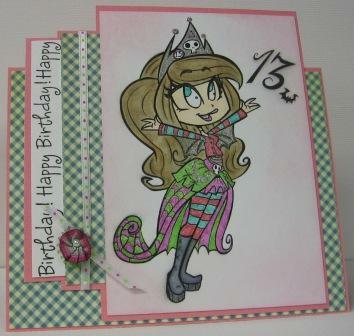 Betty went to work, and designed a 13th birthday digi image that she named after Rio. You can find it at her store. For $3.00, you can get an adorable image that can be used over and over! To top it all off, the $3 will go entirely to Rio's St. Jude's donation! Rio does not know about the image yet, OR the upcoming surprise! Betty is asking for birthday cards to be mailed to Rio in time for her birthday on Feb. 8th. She is going to collect them all, and on Rio's birthday, they will walk down together to the mailboxes, where Betty will have stashed all of the cards, along with some of Rio's fave yummies, Reese's cups and York Peppermint Patties! After her birthday, Betty plans to take Rio to St. Jude's, where she can hand deliver her donation. How cool is this, I mean really.......! 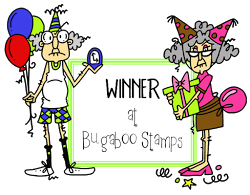 Hurry over to Simply Betty's Stamps, look for the link to Rio's Birthday image, and help out some very unfortunate children! Let's help Rio know that what she is doing is a very good thing, and that she is providing a special blessing for these kids! Here's my card with the image.....scroll down for mailing address! Thanks for stopping by! Wow, where has January gone? December 2010 to January 2011! Time really DOES fly when one is having fun! Today is my last post for Craft Your Passion Challenges. I have greatly enjoyed working with the ladies at CYP - they are a lot of fun, and I thank them very much for asking me to join them in their challenges this month! I was given this adorable tweed hat image to work with today. This is another Cocodingo image that can be found in the store at CYP. I thought it would be fun to use this new paper pack that I found last week when I was at Archiver's. It's a Cosmo Cricket 6 x 6 pad, called Material Girl. I fell in love with the patterns in it, and had to have it. The hat was colored with Copic markers. I took a second image, colored it, cut the hat out, and adhered it over the first hat using dimensional dots. The challenge this week at Craft Your Passion is to use two DP's. 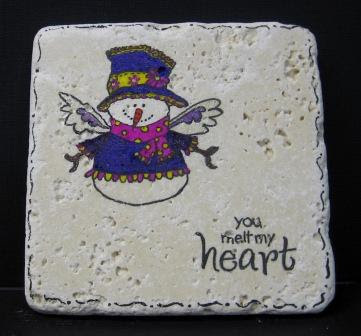 Hope to see your wonderful creations on the Craft Your Passion Challenge link this week! Again, thank you to the CYP gals for asking me to serve as January's guest designer! Hope that you are having a good Sunday morning! We're expecting another 3-4" of snow today. I would, however, LOVE to see the sun now and then! Today's challenge hostess at Stampin Sisters in Christ is Lovely Linda! The Lord hath appeared of old unto me, saying, Yea, I have loved thee with an everlasting love: therefore with loving kindness have I drawn thee. 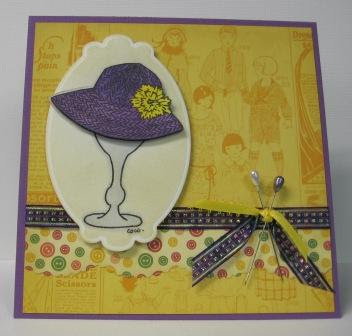 Linda's challenge to us today, is to create a vintage style card! Our very generous sponsor is Designed2Delight. One lucky winner will receive two free digital images from her store! Those of you who know me well, know that I have three styles that make my knees knock in fear; clean and simple, masculine cards, and yes, vintage! Well, with this beautiful image, called Love Collage, from Designed2Delight, this card was a snap! Yay me! 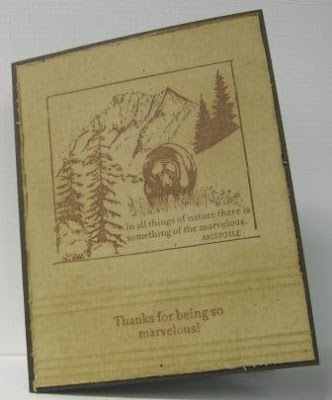 Be sure to hurry over to the Stampin Sisters in Christ Challenge Blog to see Linda's thoughts on today's scripture, and to see the beautiful creations of my DT sisters. We hope to see your Vintage style creations this week! 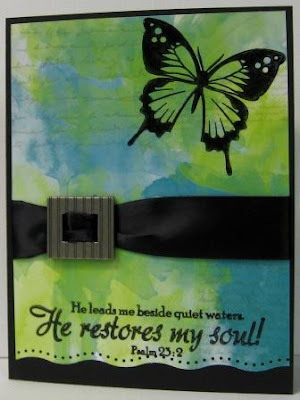 Come back to Stampin Sisters in Christ, and link up your entry for a chance to win some beautiful images from Designed2Delight! P.S. 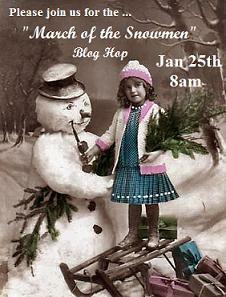 Don't forget to stop back by my blog on the 25th for the March of the Snowmen Blog Hop! Get your cup of coffee or cocoa, and settle in for some beautiful eye candy, and a whole lotta blog candy as well! Today's card is for a challenge that I saw over at The Angel Company. The challenge is a one-layer card. I had gotten this set of stamps (from my friend Shirley, who's an Angel) last month, and had not yet inked it up - perfect timing to do so! The set is called Marvelous You. 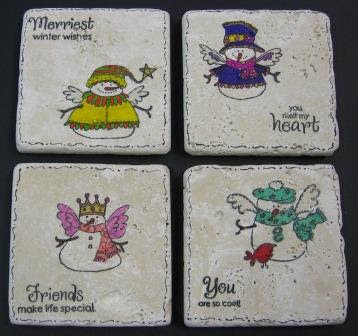 There were 4 sentiments, and the focal image for only $10.95!!! Great image for a masculine card, don't you agree? Thanks for stopping by! Hope to see you on the 25th for our March of the Snowmen!!! It is time to talk about the paper cutter post from last week! I was totally impressed with how many different methods of cutters you all use! Many of you used Fiskars cutters. A few are very happy with these cutters, but many were disappointed with the blades dulling too quickly, and lack of straight and sure cuts. Some seemed very pleased with the Stampin'Up! Table Top Cutter. No one had any complaints about it. I was told that it is self-sharpening, and cuts more than one piece of CS at a time. Creative Memories was mentioned a few times with no complaints. Favorite scissors mentioned were Kai, and 'fancy scissors'. 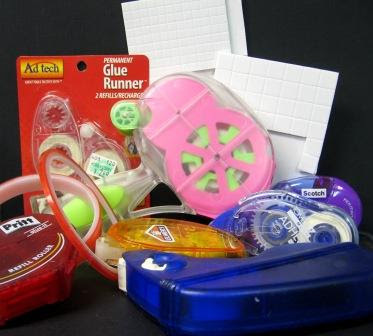 One reader has tried Carol Cutter, Fiskars, Tonic, Zutter, Creative Memories, and Purple Cow, just to name a few. Her fave is the Purple Cow, but she also loves her 12" Tonic Trimmer. For cutting CS in half, she uses the Zutter Dream Cuts. Another reader mentioned with obvious happiness, that her 'cutlery of choice' is a cutter by Xacto. The Creative8 cutter found at KMart was another favorite of one reader. Another that I hadn't heard of was the Carl's Cutter (priced best at Oozaks per my reader!). The Making Memories Cutter didn't seem to bring any happy dances; readers said that it dulls, and there are no replacement blades. 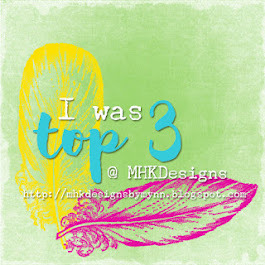 All in all, the favorites seemed to be the Tonic 12" Cutter, The Purple Cow, and the Stampin' Up! Tabletop cutter. The problem areas in the other cutters were that the blades dulled too quickly, they don't cut straight, and don't have great measurement markers. As for myself, I can vouch for the Purple Cow that I use when I am at the house of a friend, and the Dream Cuts by Zutter. I love my Dream Cuts for cutting multiple sheets in 1/2 or 1/3's, and it will hold up to 12 x 12 papers. The ONLY drawback to it is that I can only cut one piece at a time, but it's so straight, and so quick, that I can't really complain! I hope that this has helped some of you with your cutting decisions! I think from the comments left, and the personal e-mails that I received, that my next table top cutter will probably be the Tonic 12" larger, tabletop style cutter. When and if I get one, I will let you know how I like it! Drum roll please...... I promised an itty-bitty blog candy! The winner is Sandy Ang! Sandy, please e-mail me at: mamagilliam@gmail.com with your mailing information. Congrats on winning this 'itty-bitty' blog candy...lol!!! Thanks to all of you for your cutting advice! I'll be back soon with a new question!!! Wowzers, can you believe TWO posts from me two days in a row? This post is for Craft Your Passion Challenges. I was asked to use this image Lauretta's this week. It is called Good Fairy. Don't you just love it when your DP does all the work? While shopping at Archiver's yesterday (yes! I got up to the city with dear friend Shirley! ), I found this gorgeous paper collection, "Once Upon a Springtime", by Graphic 45. Wow - just perfect for Lauretta's image! The challenge this week at Craft Your Passion is to "Button it Up" - use button(s) on your creations. I can't wait to see what you create with your beautiful collection of buttons! Hurry to your craft caves - design something beautiful, and hurry back to post it at Craft Your Passion! Thanks so much for dropping by! It's always good to see you here! Have a great week, and be sure to find some time for creating! I hope that you have had a great weekend. Friday, my friend Shirley and I went to Archiver's for the 9 mini Valentine Cards Class. I will share them with you on Tuesday. The class was okay, but could have been better. Projects were cute, would mass produce easily, and were very CASEable. My weekend has been good. Have been working on 1099's, etc., so it's been busy, but the highlight of the weekend is that gram and gramps are pup-sitting this weekend for Rosie the wonder-granddaughter-dog! DD flew to Phoenix this weekend to meet up with a friend, and run the Rock and Roll Half Marathon. You know, this pup sitting is a tough job, but somebody's gotta do it.... (insert ginormous smile here!). Grace challenges us to use the theme of "NEW" and interpret it as you want: new year, new life, new birth, new supplies, new house, etc. When you enter the challenge, please tell us what you used to fit our challenge! Our sponsor this week is Clear Dollar Stamps. We appreciate CDS, and thank them for being such a faithful and generous sponsor! For my card today, I have used a darling digital set from Clear Dollar Stamps. My card is for a dear friend who is moving into a new home very soon! She has been crafting out of boxes, (and doing a better job than I do! ), and has moved from one state to another! So, my card is for a new home! Clear Dollar Stamps Digital Image and Sentiment, Basic Grey Curio Collection, Ribbon from my stash, Coloring done with Copic Markers, Flower from Hobby Lobby. Be sure to head over to the Stampin' Sisters in Christ blog, to see Grace's gorgeous creation, and read her thoughts on the scripture she chose. Without a doubt, you will be uplifted, and given much food for thought for the upcoming week! Can't wait to see your challenge entry! My Itty-Bitty Blog Candy Winner will be announced on Wednesday! Thanks to all who have left comments, and shared their cutting secrets with us all! Hi ya'll, and Happiest of Tuesday's to you! We have beautiful, white, fluffy snow on the ground today, and brrrr....it is COLD outside! Thankfully, I don't have to (couldn't even if I wanted to) go anyplace today! So today's question comes from one of my readers. She is curious as to what type of 'cutters' we all use. I am curious, as well! and I will dig up another itty-bitty blog candy!!! If you are one of my followers, I will enter your name twice. Drop me an e-mail if you have any suggestions for questions in later blogs!!! I'm having SO much fun, and learning a lot, reading all of your comments and suggestions! Have a great day - back to my girl cave! Just kidding - no chicken dinner. Sorry. I'm terribly mean sometimes! A few posts ago, I asked you all to share your adhesive favorites with me. I had a total of 19 comments. The favorite seemed to be the ATG guns. My friend Dawn, has the monster gun with the really agressive tape, but it seems that most of you have the smaller pink gun that you can get at the big box stores or on-line. Heads Up! Enabler alert regarding the pink guns! My friend Patti (the other Patti Sue) says that she gets her refills from Joan's Gardens. Patti says that Joan runs specials from time to time, and sells them at "buy one get one for $1" prices - WOWZA!!! Can't beat that with a stick! and my favorite answer (thanks Maria) was....anything and everything! I hope that these answers helped you make some sticky decisions! So, on to the winner of the itty-bitty blog candy!!! You are the winner of the itty-bitty blog candy! Please e-mail me at mamagilliam@gmail.com with your mailing information! Tune in tomorrow for the next itty-bitty candy question!!! It's another week, and it looks like Mother Nature is going to blast us tomorrow and Tuesday...! Today brings another challenge at Craft Your Passion Challenges. 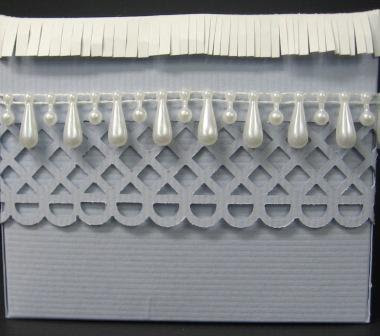 (Use Ribbon, lacing, or anything you can tie on). For this week's challenge, I was given one of Corrine's CocoDingo images to work with. She was a joy to color - used my Copics! 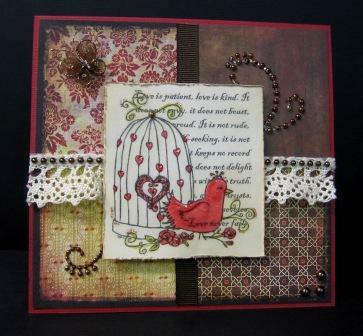 I'd love to see YOUR card entered in the challenge this week at Craft Your Passion!!! Have a great Monday - Patti J. 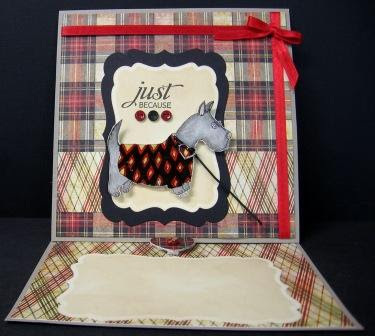 As it is Sunday, it's time for the first challenge of 2011 at Stampin' Sisters in Christ! but I think we are all happy to be back in our regular routines. Our very talented sister, Chris, is the challenge hostess this week. we greatly appreciate their continued support! May the Lord repay you for what you have done. May you be richly rewarded by the Lord, the God of Israel, under whose wings you have come to take refuge. 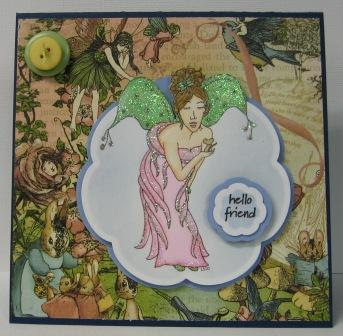 Chris' challenge for us today, is to create a card or project which includes wings. My card features a beautiful butterfly - when I think of wings, my mind immediately turns to butterflies and angels. Please head over to the Stampin' Sisters in Christ Challenge Blog, to see what wonderful words of wisdom Chris has left for us! While you are there, you can check out the beautiful creations of my DT sisters! I've been peeking, and I guarantee that you'll love what you see! Stamps by Gina K. Designs. All coloring is done with pencils and mineral spirits. I'm looking forward to seeing your 'wings' this week!!! 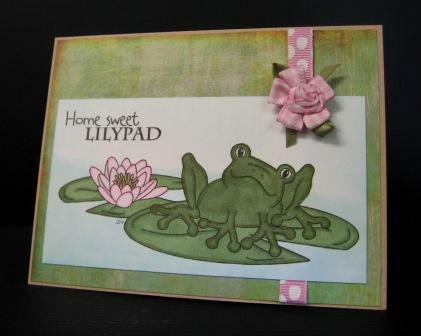 Today, I have another card for One Crazy Stamper Challenge Blog. They have two guest designers each month, so sadly, this is my last card for them. It's been fun using their stamps, and playing along! Again, if you haven't been over to One Crazy Stamper to shop, you should check them out! The theme that I was asked to use was "Love". I chose this adorable image by Penny Johnson, called "Love Bubbles". It was SO incredibly fun to color - I love it! 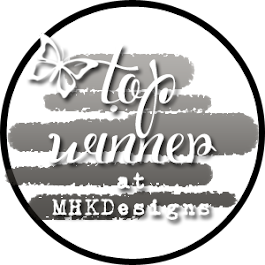 Have a wonderful Friday, and be sure to stop over at the One Crazy Stamper Challenge blog to see what the other fabulous designers have created for you today! Another Question (& an itty-bitty blog candy) for the Smartest Readers in the World! It's actually a very nice day in Missouri for being January! I wanted to thank you all for your 'printer' help a few weeks ago! Being that I limited my budget to 'way low' for this, I think I did well! so I did end up with another HP. so that the paper didn't have to go 'around' anything to feed. I ended up with a back-feeding printer/scanner combo that is wireless. It is doing a great job, and although our wireless is pretty slow here, the nice copies and jamless print jobs are well worth the wait! The paper/cardstock feeds very well, the copy quality is good, and are you ready for this? At Office Max, it was under sixty bucks!!!! I'm curious to know what adhesives you all use. when I pull them out of the envie. I've also created cards, and put them in my stash. being in a box, pile, basket, etc.??? whose name I draw from comments from today's post. 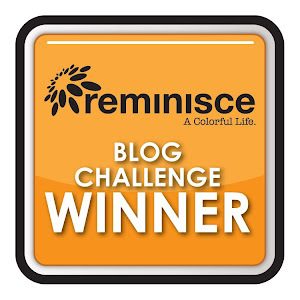 If you are a blog follower, you can comment twice, for two entries! Auntie Em was my last itty-bitty candy winner! She won some clear stamps from the dollar bins at JoAnne's crafts. All righty - can't wait to hear your answers!!!! Winner of the 'itty bitty candy' will be chosen on Monday - good luck! Meet Rosie... the Wonder Granddaughter-dog! Last Thursday afternoon, DD and I had an adventure! "get your shoes on and come meet me NOW"!!! I got my shoes on, used the restroom (thank heavens! ), and went to meet DD. It seems we were on our way to meet (and bring home) our little Rosie. DD and I met in a town about 30 min. south of here, and drove from there. I didn't clock it, but I think it was about a 1.5-2 hour trip each way. We began on a two lane highway, which turned into a narrow two lane road, complete with one way bridge, which turned into a gravel road, turning into a narrower gravel road with one lane bridge. The road continued to narrow, the gravel became smaller, and less, and suddenly we were on a mud road. The mud road then became narrower, until it was very nearly a one lane road. The last of the directions given to us was to look for the black dented mailbox. Lol... If I would have had to turn around, I would have needed clean clothes! Oh, and did I mention that it was threatening to rain? Yup, and the water was already up to the edge of the road/er... mud from the last time it had rained! Anyway, we had a great day - we laughed a lot, met and fell in love with Rosie, and now DD has a partner in crime! 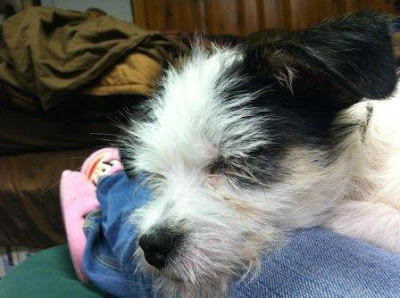 Rosie was found, nearly dead, and this stray program ended up with her. She is a tough little cookie, which is why she ended up being named Rosie (as in the famous Riveter)! The stray program took excellent care of her, and she was such a sweetie when we saw her. There were a total of 42 dogs in this yard, and by the time we left with Rosie, there wasn't an inch of our clothing that wasn't covered in red muddy pawprints and hair of many lengths and colors! Rosie's first stop after leaving her foster momma was the vet, where DD had her checked out thoroughly. She's perfect! Her disposition and personality are so sweet, and she is SO smart! Now, I know that being grandma makes me a bit partial, but she really is smart! She is already sitting on command, and with hand signals, she's learning 'down', and knows to sit until DD tells her it's okay to eat when food is put into her dish. She was already totally dedicated to DD by the time we got home last Thursday. Amazing how fast they bonded! All in all, DH and I are very sure that Rosie is a 'keeper'! We already cannot imagine life without her, and can't wait until next weekend when we get to doggie-sit while DD flies out of state for a half-marathon race! I'm sure you can expect to endure more photos, as she's only 10 lbs. and about 4.5 months old. We'll simply have to update as she grows! Thanks for being patient, and letting me brag!!! I'd love to hear what you think about her!!! It's been a very busy 'week after Christmas' for me - how about all of you? I'm not sure where the time goes! We had the excitement of getting a new grand-dog on Thursday! 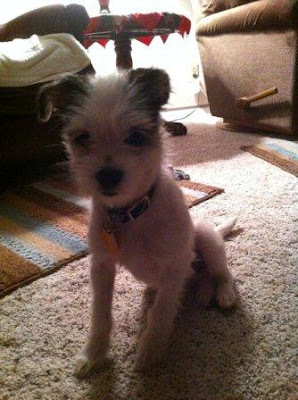 DD has adopted a darling Jack Russell and Cairn Terrier Mix. I will try to post some pictures tomorrow. I know I am partial, but she is one smart little pup! Melissa already has her sitting, staying, and is working on her bringing her leash when she needs to go outside. She's been named Rosie, after the famous Riveter, since she's a tough little cookie. 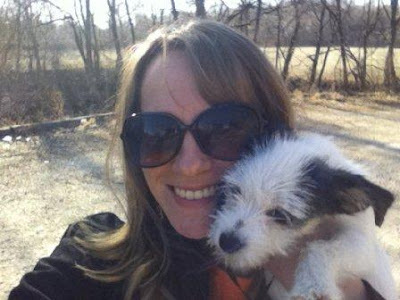 She was a 'dumped' dog, and nearly died. She is up to a whopping 10 lbs! Stay tuned for photos! for One Crazy Stamper Challenge Blog, for the month of January! What a fun bunch of DT gals, and they are SO amazingly talented! I'm still pinching myself for being invited to join them this month! If you've never been shopping at the One Crazy Stamper store, you must go...now!!! What fun! Their challenge this week is an open theme challenge. For my card today, I chose to use this darling Magnolia, Princess Tilda stamp. I wish you could see her sparkles! I went over her in many places with clear stickles, and she sparles beautifully! You might want to enlarge the picture so the glitteryness shows! Oh, and I am proud to say that ALL coloring, even the hair (!!!) was done using copics! The CS is Bazzill, and the dotted DP is The Angel Company. Butterflies are punched from a Martha Stewart punch. The sentiment is Hero Arts. I'll be back with another project later in the week for One Crazy Stamper, so be sure to check back! I'd love to see YOUR projects, so head over and enter the challenge! I'll be by to check out your creations!!! I am also very flattered and excited to be a Guest Designer this month for Craft Your Passion Challenges!!! 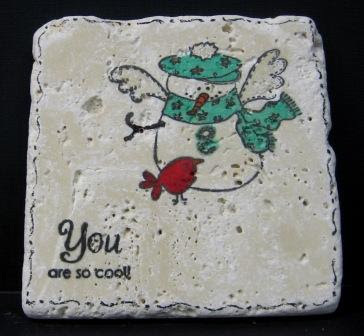 Craft your passion has digital images by Lauretta's Digital Stamps, and Cocodingo's Digital Stamps. If you have never been over to visit at Craft Your Passion, that's another 'must go'!!! Their challenges are so creative, and their digi's are adorable! The challenge this week at Craft Your Passion, is an open theme as well. I was asked to use an image by Lauretta, and I chose to use her Scotty Dog. I thought that this Basic Grey DP would be a perfect background for her darling dog. I added a bit of glossy accents to Scotty's 'raincoat' (since we've had so much rain this winter), to give it a bit of shine! Again, the shine doesn't show, so feel free to enlarge the photo so you can see the shine! Coloring is done with pencils and LOMS, and Sharpie's. Sentiment is from The Angel Company. I'll be looking forward to seeing YOUR creations! Hop on over and link them up, and I'll be by to see you soon!!! Well, dear friends - that's all I have for you today. I wish you all a wonderful 2011, full of happiness and good health.